As hard as winter has come on this year, this past week has really taken the cake (except I started writing this post last month and got sidetracked). The work week began with blizzard warnings and ended with windchill warnings as the coldest temperatures in the world were registered in this province. 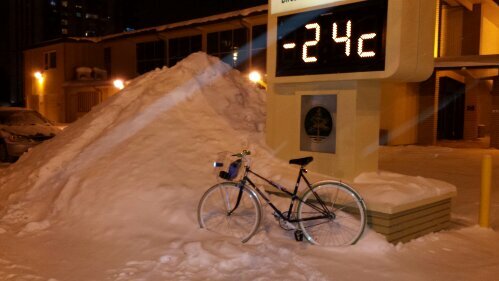 In E-Ville, though, life doesn’t stop for the weather, and bicycle is still the best way to get around. 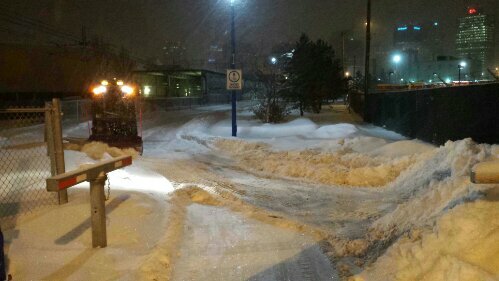 With the snow coming down and drifting on Monday night, I had to ride cross town. As I’ve always said, riding through fresh snow isn’t a problem, it’s when the cars start packing it down and churning it into oatmeal that things start getting dicey. Still better than waiting in the cold for a delayed bus. A little trail maintenance is a nice touch, though. 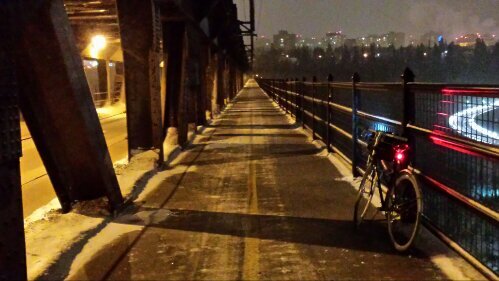 And while the approaches to the High Level Bridge were drifted over and close to impossible to navigate, the upwind side of the bridge deck stayed clear. With days of warnings of the storm, the streets were empty, the desolation more striking than the bitter wind. 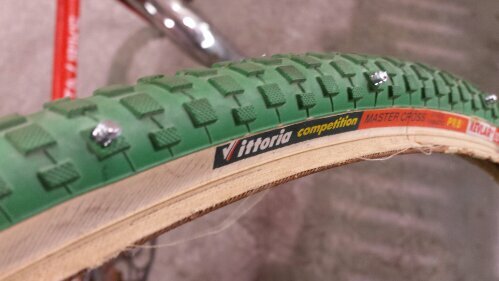 It’s all enough to make a girl stud a green tire for her fixte. For the record, I haven’t used my front brake since I installed the studded tire up front, though I have had a couple of hilarious slow motion falls into snowbanks while getting my riding boots caught in the pedal straps. My long awaited bottom bracket and large track cog came in time to witness more than double the average snowfall through the the first months of winter. Unfortunately, it appears that Shimano doesn’t test their grease in E-Ville conditions as the bottom bracket starts getting extremely stiff below -15C. I’ve compensated by bringing the bike indoors whenever possible. We got long runner mats for the living and dining rooms to deal with all the slop melting off the bikes. Blizzards, too, must pass, usually not without some subsequent arctic air. 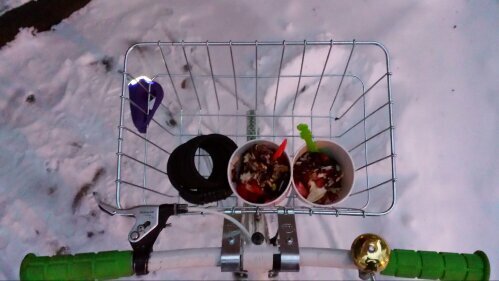 I celebrated the cold snap with vegan Froyo for me and my sweetie. When it’s this cold, it’s very easy to transport without it spilling or melting. Life is sweet. Cold and sweet. After the warmest December and early January in memory, winter has arrived with a vengeance in E-Ville, with temperatures in the -30’s and windchills between -40 and -50 (Celsius, not that it matters much when it’s this cold). Being a winter city, E-Ville doesn’t shut down for cold or snow, and even though it’s a shock to the system, I still have to get to work somehow, despite the fact that it’s so cold. 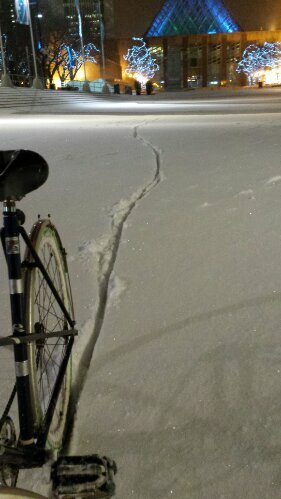 It’s so cold that all the grease in Globe froze solid after I left it outside, and I could barely ride or steer it. Luckily, Porta-Bike was still indoors after Xmas undecorating, so I had an option that still had moving bearings. It’s so cold that my fully-charged light’s low battery indicator came on after 10 minutes. It’s supposed to last 8 hours at that setting. It’s so cold that exposed skin freezes in under 10 minutes. My commute is 40 minutes. As long as I’m well dressed and can keep the blood pumping, I can avoid frostbite. 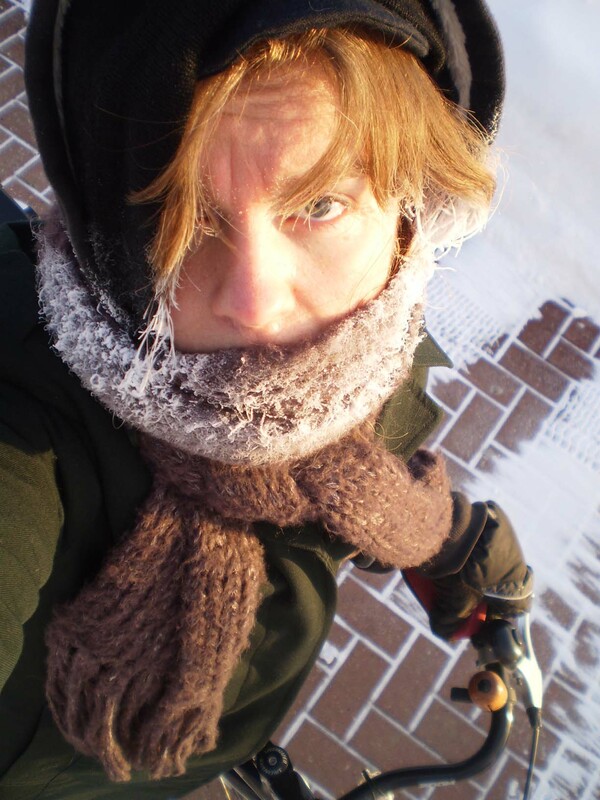 It’s so cold that frost rapidly creeps into my extremities every time I stop riding, and a red light was enough for my feet to start going numb. 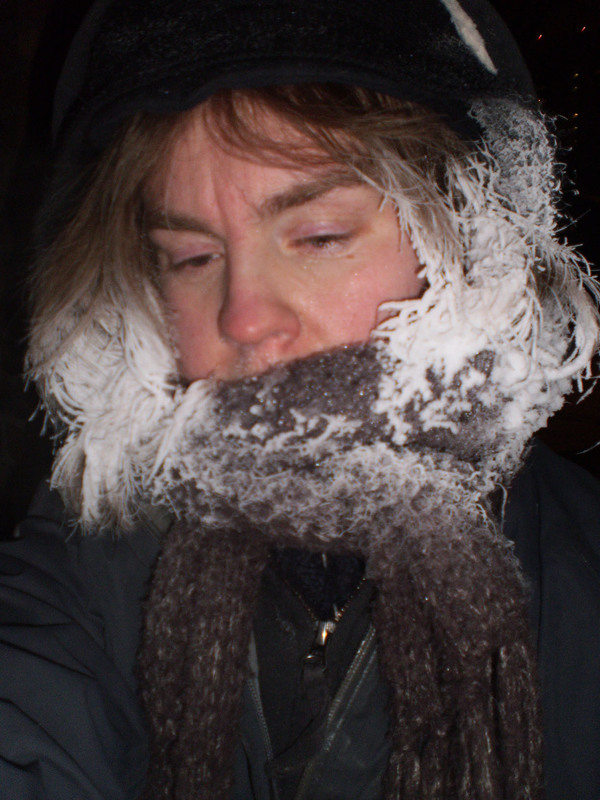 It’s so cold that breath sublimated in the hair causes a peripheral vision white-out. It’s so cold that it takes 30 minutes to dress because of all the layers, and one day’s worth of clothes completely fills the laundry hamper. It’s so cold that my eyelashes start freezing together after less than 5 minutes of riding. It’s so cold that if you spill your coffee outside, it could bounce back. It’s so cold that neither my camera nor my exposed fingers will work for more than a minute outside their cases, so the above picture is the only one you get. It’s so cold that when I take off my mitt outside, steam comes out. It’s so cold that even the hardy people born & raised here are complaining. It’s so cold that this entire post was written without hyperbole. With iced over windows obstructing my view of the outside world yesterday morning, I had to check a forecast to see what winter had in store for me next: Windchill -36, 2 inches of fresh snow plus drifts, and a headwind. Crap. I don’t know how much more of this I can take. I threw some Boomtown Rats and Gnarls Barkley onto my ipod and began the process of layering all of my warmest clothes, while also wearing a favorite summer frock over my most form fitting merino sweater to try to remind me that I’ve almost made it through the winter. I headed to the LRT station with Porta-Bike and found an overcrowded platform with the normally mute commuters all discussing how long they’d been waiting, how many trains had gone by the other way and speculating the cause of the delay. From the stories many of the commuters were telling, breakdowns have been pretty common this winter, and it turns out one of our city councilors also ended up in LRT limbo on this Monday. I decided to chance the wait, and after about 20 minutes a train arrived to a station full of cheering people. 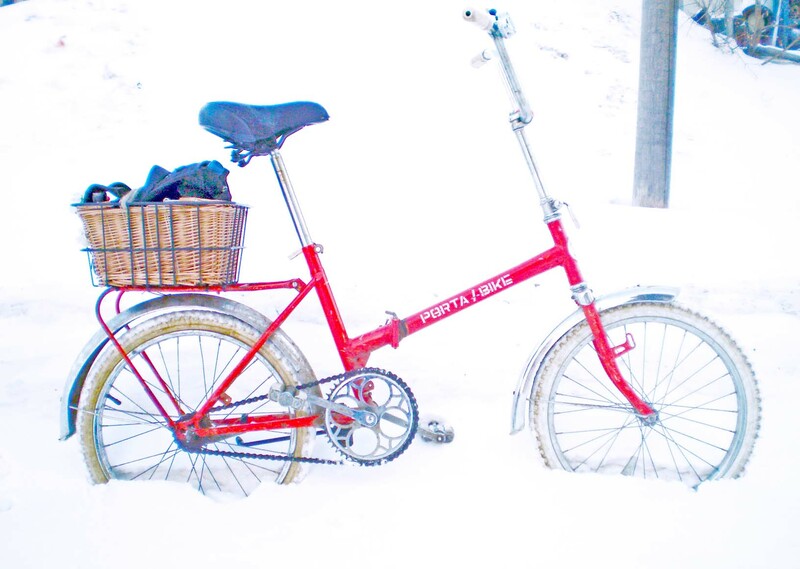 Polar Porta Bike after the storm, in the white. The other end of my commute was more daunting yet. Snow was falling and blowing horizontally, stinging my face, while the rapidly drifting snow obscured the plowed sidewalks and roads and the boundaries between them. It was all I could do just to keep my head up. Whenever I looked down I became disoriented by the featureless white expanse, and the whole time snow and ice were freezing onto my eyelashes, causing them to droop and stick to each other. This was becoming some sort of extreme cold weather exercise in sensory deprivation, and sensory deprivation and traffic don’t mix. As I became more and more removed from the blizzardy white reality, my brain started to fill the sensory void with speculative dreams of a distant icy past. Humans have been living in climates such as these and worse long before the advent of cars and central heating and all the technologies we couldn’t imagine surviving here without. For a moment, the snow obliterates all the post industrial structure, and offers a glimpse of my ancestors who survived treks into the prairie winter with only heat generated by their muscles and shear determination not to stop. In comparison, I’ve got it easy, with my fleece and toe warmers and warm destination, and I am, after all riding the most efficient form of transportation humans have ever created. I wonder how many drivers thought me crazy as they passed, and wonder how many of them also had ancestors who survived brutal winters. As a whole, I think humanity is a lot tougher than we give ourselves credit for, and I wonder if the physical perseverance that allowed us to spread to nearly every corner of this planet over the millenia is still relevant in modern times. A quick panda in the bitter post-storm sunshine, on a rare patch of cleared pavement. By the time I rode home, the sun was peeking through, and I was rewarded for my morning toil with a strong tailwind all the way home. Windchill + tailwind = WIN!